Pochoir in colors; 1937. Cramer books IV, Fundació Joan Miró, Barcelona. Signed in pencil lower left: Miró and annotated H.C. (hors commerce). One of the extremely rare signed impressions of this pochoir published in Cahiers d’art 1937. 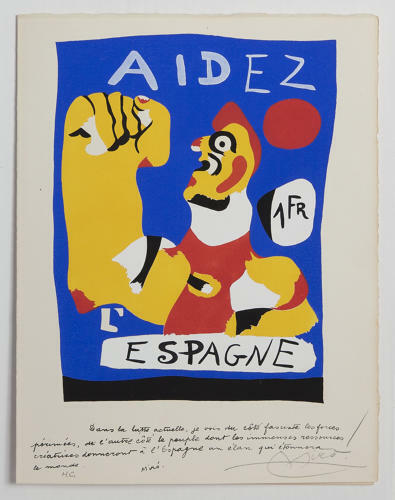 Miró gave these signed impressions to friends and the staff of Cahiers d’art. This issue was published in aid of the Republic of Spain, then engaged in a horrific civil war. The so-called Nationalist forces, nominally led by Francisco Franco but powerfully aided by the Italian fascist government and Germany, were relentlessly driving the Republicans back on all fronts, even though the Soviet Union had sent some materiel to the Republic. The rest of the world was divided in its sympathies. The Civil War was seen as a struggle between fascism and socialism. The Spanish Republican government was supported by Spanish socialists and anarchists while Franco appealed to the Spanish political right and indeed later made no attempt to dissociate himself from the Germans or the Italian or Spanish fascists. The Spanish Civil War divided the sympathies of people in Europe and the United States in cruel ways. Even those who did not support the fascist governments of Europe were wary of supporting the Republican cause, aided as it was by the Soviet Union. Miró believed passionately in the cause of the Republic, a position he never retreated from even after the defeat of the Republicans and the formation of an avowedly fascist government by Franco in 1939. Our pochoir marks the beginning of a very important turning point in the artist’s career. From this point through the 1930s and 1940s Miró never abandoned his political stance. Artistically one can see here the first elements of the biomorphic abstraction that he developed in the 1940s and which became a central compositional and formal element of his art. It is fair to say that the graphic arts were an essential means of expression for Miró; he continued to work in this media until the last years of his long life.